Nutmeg seed is grated or ground for use as a spice that may attract your pet with its enticing aroma. Harmless in small quantities, nutmeg in larger amounts can be poisonous to cats and other pets. The aroma of this festive spice can attract your cat's interest. It's important to keep nutmeg and other such potentially harmful attractions safely stored away. If you suspect nutmeg poisoning, seek veterinarian advice immediately. 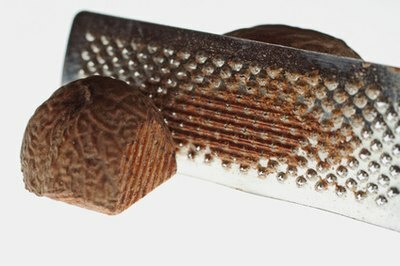 Nutmeg in its spice form is made by grating or grinding the seeds of plants of the Myristica genus, found in Southeast Asia, Australia and the Pacific Islands. In Medieval times, the spice was a valued trade commodity and the object of wars. Nutmeg's essential oil contains myristicin, a toxin that is relatively harmless in small amounts, but poisonous in larger quantities. The exact poisoning mechanism isn't well understood, but it's well documented. Small amounts of myristicin are also present in parsley and dill. Cats are infamously curious and may sniff or eat nutmeg. According to the American Society for the Prevention of Cruelty to Animals, small amounts are likely harmless. "Taking a lick or two of ground nutmeg is not likely to pose a serious problem for your cats," notes an "Ask the Experts" page on the American Society for the Prevention of Cruelty to Animals website. "However, we'd still recommend using caution to prevent them from ingesting problematic quantities." It's best not to leave a quantity of nutmeg out on the counter where the cat can get at it, and it's best not to share even a little of your holiday eggnog with any pet. If your cat eats too much nutmeg, his behavior will clue you in. Nutmeg overdose symptoms can include tremors, seizures and other nervous system abnormalities. Untreated, these symptoms can escalate, and death may follow. If you suspect nutmeg poisoning, call a veterinarian or an animal poison hotline immediately, and follow instructions. It's best to ask your veterinarian for emergency contact numbers before any emergency occurs. If you can't contact a veterinarian in an actual emergency, call an animal poison hotline. Two reputable groups are the National Animal Poison Control Center, 1-888-426-4435 or 1-900-443-0000, and Pet Poison Helpline, 1-800-213-6680. They generally charge flat fees for their services. Do Cats & Rabbits Get Along? Does the Herpes Virus in Cats Cause White Blood Counts to Be Low?